American DJ WiFLY Par QA5 DJParts - All Variety of Parts that DJ Needs. The ADJ WiFLY Par QA5 is a rechargeable lithium battery powered compact Wash Fixture with ADJ’s WiFLY Transceiver with wireless DMX built-in. It offers the power of 5x 5-Watt RGBA Quad LEDs (Red, Green, Blue & Amber) to create rich hues and smooth color mixing for stage or wall washing, plus the freedom to set up your fixture wherever you wish without the restrictions of power or DMX cabling. The built-in battery will keep a charge for up to 6 hours (full on) from a full, single charge. WiFLY’s Transceiver will communicate up to 400 feet (open line of sight). This fixture uses LEDs rated at 50,000 hours with a maximum power draw of 55W. DMX addressing may also be changed by the unit’s 4-button LED display, or controlled by a DMX Controller by DMX cabling or via ADJ’s stand alone WiFLY Transceiver, or the ADJ RFC wireless remote control (both sold separately). The WiFLY Par QA5 operates in AC or DC power. 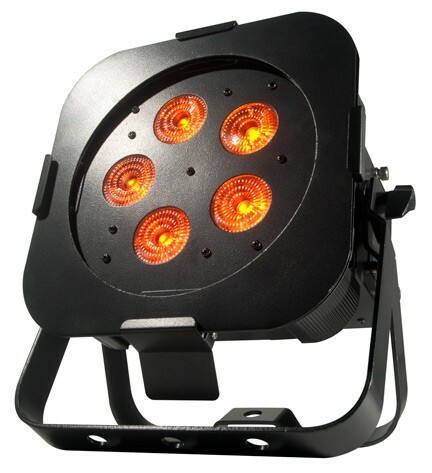 Specifications: • Rechargeable Lithium battery powered, with wireless DMX, slim flat par fixture with 5x 5-Watt QUAD LEDs (4-in-1 RGBA- Red, Green, Blue & Amber) • Unique “sit flat” design – Power & DMX Ins/Outs are intelligently designed so the unit can be set flat on the ground or set inside truss • Variable RGBA color mixing offers a seemingly unlimited color palette - Great for Stage or Wall Washing! • Low profile case design • Compatible with ADJ’s WiFLY Transceiver Wireless DMX onboard • Compatible with ADJ RFC wireless remote control (sold separately) • 8 DMX Channel modes: 1, 2, 3, 4, 5, 6, 7 or 8 channel modes • 6 Operational modes: Manual Color Mode; Color Change Mode; Color Fade Mode; Auto (Program Run) Mode; Sound Active Mode and DMX-512 Mode • Smooth RGBA color mixing (fast or slow color change operation) • QUAD LED (4-in-1) projects no RGB shadows • 15 built-in Color Macros • LED pulse and strobe effect • Flicker Free • Electronic Dimming: 0 - 100% • Beam angle: 25-degree • Linkable via 3-pin XLR cable (In/Out) • 4-button LED DMX display on rear panel • Dual bracket yoke allows fixture to be hung or set on the ground • IEC AC IN/OUT outlets on rear to daisy chain power (up to 10 units) • Includes gel frame for optional diffusion filters • Run all night – No duty cycle • Long Life LEDs (50,000 hrs.) • Power Draw: 55W max • Rechargeable Lithium battery life: 6 hours full on (with a full charge); 9 hours charge time • Multi-voltage operation: AC 100-240V, 50/60Hz (IEC power In/Out) • Dimensions (LxWxH): 10.5” x 9.5” x 6.5” / 265 x 240 x 164mm • Weight: 10 lbs. / 4.2 kg.